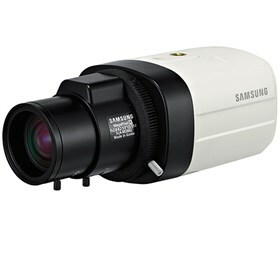 The Samsung SCB-5000 is a fixed analog box camera that has a 1/3" CMOS progressive scan sensor that produces 1.3MP resolution images and 1000 TVL video in normal to low light conditions with minimal noise. With a 0.03 Lux Minimum Illumination at f/1.2, this camera allows you to capture color video during the day and black and white video at night. With SSDR, the SCB-5000 High Resolution Camera balances the dark spots in images more visible for accurate monitoring. The high-resolution camera with Day/Night function switches between color and B&W as per changes in ambient lighting, ensuring accurate color reproduction in daylight and enhanced B&W images at night. With SSNR IV digital noise reduction technology, the camera offers color images in dimly-lit areas with reduced noise in the picture, and helps saving storage space. Gain control adjusts the signal strength to maintain a constant brightness level, and auto white balance adjusts the red and blue signals by taking a standard white color reference to get the most natural colors. The Samsung SCB-5000 has many exciting features for users of all types. You can extend the lifetime of your Samsung SCB-5000 with the purchase of a FactoryOutletStore Factory Protection Plan. The Samsung SCB-5000 is sold as a Brand New Unopened Item.